This afternoon Grandpa helped Isaak up off the couch and pop went Isaak's arm. He cried for 20 minutes. My parents had a hard time understanding what happened to his arm. When I picked him up and they told me what happened; I thought I knew what it was. I read about Nursemade Elbow before. Plus one of my friend's sons had it twice before. I just couldn't remember the name of it for some reason. My friend's son got it from someone helping him up just like Isaak. Then he got it from just taking his coat off. Crazy, right? Off to pick up dinner and go to the ER. I knew Mica would never hold out for dinner! I should mention that Mica's in an All About Me stage. Mica was excited to get a Roast Beef Sandwich at Arby's. 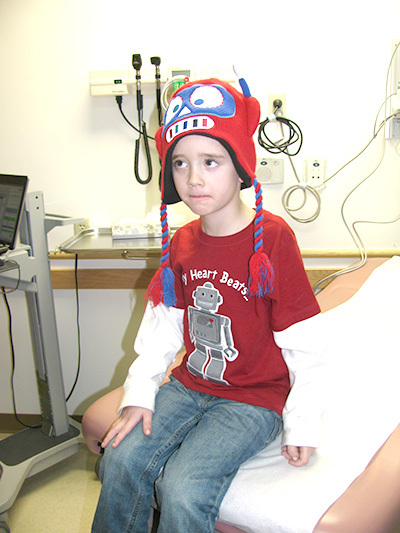 He was even more excited to go to the ER to see their big screen TV and they have toy things that hang from the ceiling. Never mind that his brother was in pain. I had to get after him. We had to go back in the waiting room for a bit. When we went into a room the doctor knew right away what happened. She asked us other questions just to be sure. What I didn't know is that he had a slight temp when they took his temperature. Well it dawned on me that he had his hat on. His robot head just overheated him. Sure enough she took his temp again and he didn't have one. Isaak had Nursemade Elbow and popped Isaak's arm back. She said that kids do not like using their arm after they pop it back because they are scared it will still hurt. 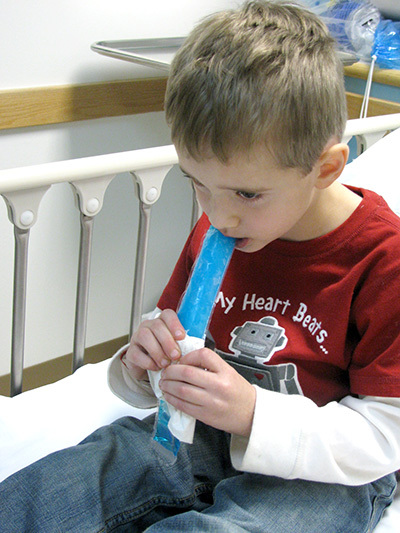 What they did to get him to use his arm, was give a Popsicle. The rule was is that she'd give it to him as long as he'd eat it with his previously hurt arm to eat it. He was back to himself. Grandpa felt guilty. There's no need to feel that way. The lady that checked him out has 4 kids. She said one of her kids had that happen 4 times. Then there's my friend's son that had it happen just from taking his coat off. Heck we box in our living room. If Isaak were to get hurt, you'd think it would be from something like that! I'm glad he doesn't need a cast or sling! With Nursemade Elbow they grow out of it after 5 years. Well Isaak will be 5 in May. I hope he doesn't have it happen again. OH NO - the poor thing. So happy to hear that he didn't need a cast or anything! And as for Grandpa - it was totally an accident and everyone knows that. He shouldn't feel too bad, but I bet he never asks one of his grandkids to help him up again. So happy to hear all is well now. I can understand why grandpa feels guilty as my husbands niece had this happen when they were doing airplane. Can easily happen! Glad it was nothing serious. Smart thinking on the hat (and smart thinking on their part w/the popsicle!). Glad to know that he didn't need a cast. Hope Grandpa is feeling okay too. bless Grandpa's heart! and bless poor Isaak's heart too! i actually dislocated Liberty's elbow when she was little...by grabbing her to prevent her falling! i still feel guilty! Wow, I have never heard of Nursemade Elbow, but I see how it can happen quite easily. I am glad he is ok now, but that must have hurt quite a lot. That is good that it is something kids outgrow. oh no... lol, I bet grandpa is really beating himself up over this..
A trip to the ER is NEVER fun! I am glad it wasn't too serious, and I hope that it doesn't happen again!